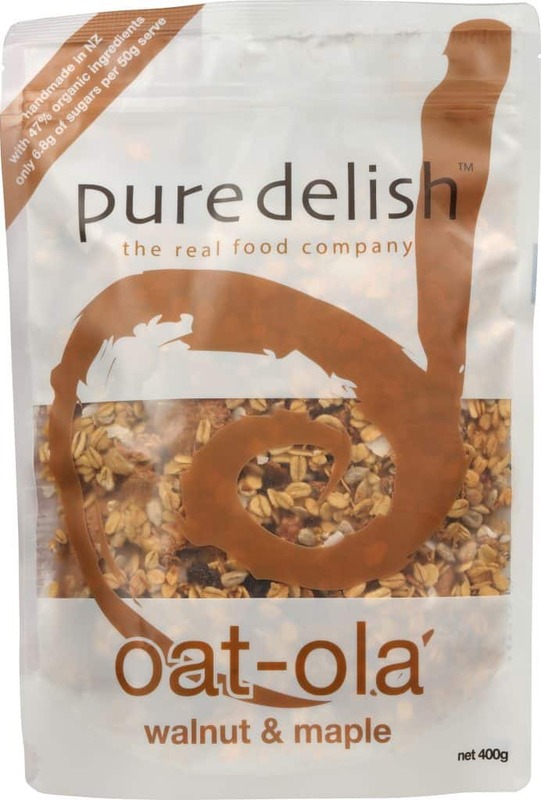 our walnut & maple oat-ola is a handmade granola made from nutritious organic oats, crunchy bran flakes, chunky walnuts and juicy sultanas. toasted until crunchy with pure canadian maple syrup and coconut nectar. ingredients: organic rolled oats (44%), nuts (walnuts (10%), organic coconut), seeds (sunflower seeds, chia seeds), wheat bran flakes (10%) (whole wheat, wheat bran, sugar, liquid malted barley extract, salt, vitamins (niacin, riboflavin, thiamin, folate), mineral (iron)), NZ cold pressed extra-virgin rapeseed oil, sultanas (7%), pure maple syrup (4%), coconut nectar, spices, cottonseed oil (coats sultanas to prevent sticking), sea salt. contains wheat, barley, oats, tree nuts and gluten.